Winter’s almost here, so for today’s Destination of the Week, we head to one of the world’s great cold-climate cities for some fresh mountain air, sophisticated European culture and, of course, raclette. We’re headed to Zurich, Switzerland. Just two words: more cowbell! 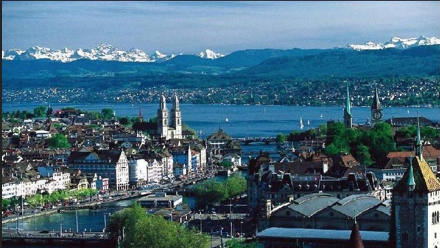 Zurich is a tidy, manageable little city along the banks of Lake Zurich and the Limmat River, with a charming Old District called the Altstadt that most visitors tend to gravitate towards. 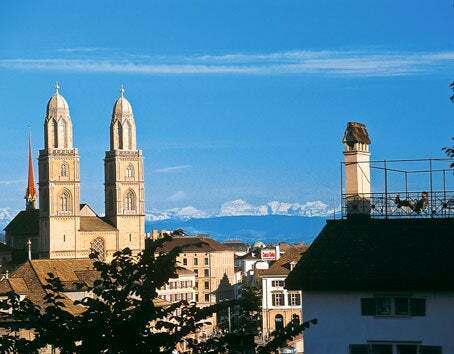 To get the lay of the land, you can walk through the Altstadt’s ancient streets to the Lindenhof where the remains of a Roman building sit at the city’s highest point overlooking the town and the Alps in the distance. The imposing towers of the Grossmunster cathedral. Art aficionados should hit the Kunsthaus museum as well as the Fraumunster church (Church of our Lady), which displays stained-glass windows by Marc Chagall, then visit the towering Grossmunster cathedral and check out the Landesmuseum to get an insight into Swiss culture and history. Fans of Thomas Mann’s literature can visit his archives near the University. Bustling 19th-century Bahnhofstrasse is the place to shop at luxury boutiques and department stores. Have an Old World shopping day at the fancy shops along Bahnhofstrasse, where you can pick up a Swiss watch or just browse display windows at the huge century-old department stores along it. 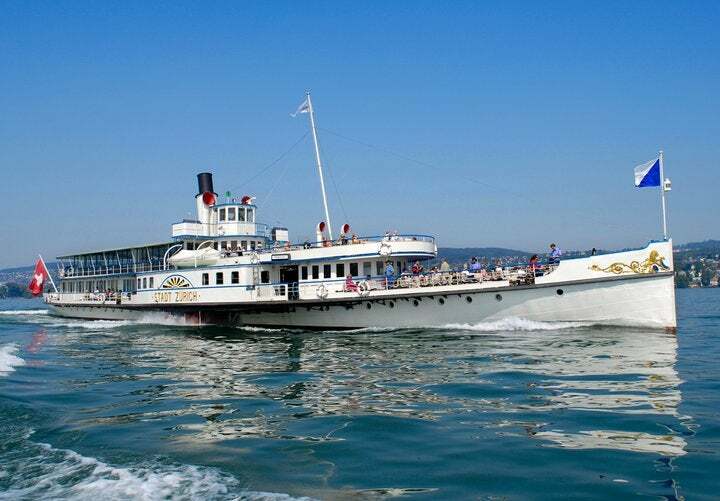 If the weather’s fine, take a boat cruise along Lake Zurich. If the weather’s nice, be sure to schedule some time for a cruise along Lake Zurich with ZurichSee (just beware, they start operating on a limited schedule later in the fall), and if you’re an outdoor enthusiast, the hiking trails in the park around Uetliberg Mountain about 30 minutes outside the city lead to spectacular views of Zurich and the surrounding Alpine landscape. There’s also a beautiful hotel-restaurant at the top with stunning views called Uto Kulm, though should call ahead for reservations.The Zoo and Botanical Garden are two other popular spots to spend a morning or afternoon. 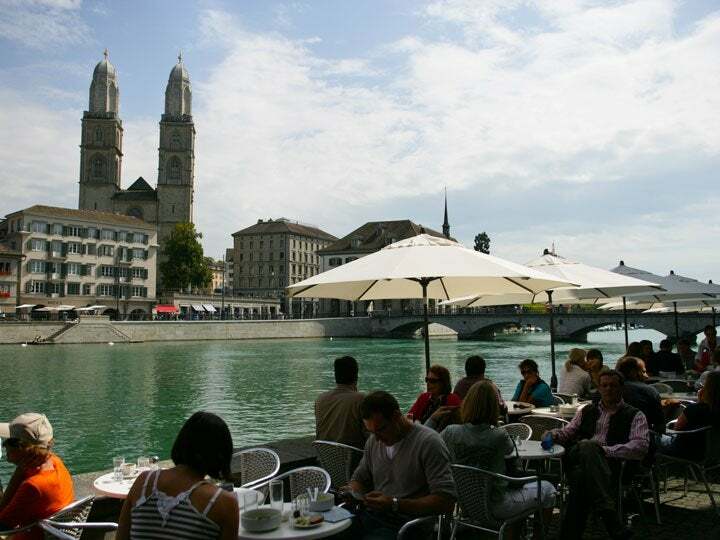 Some of Zurich’s most popular restaurants are along the Limmat waterfront. In the evenings, folks tend to congregate in the Altstadt’s restaurants and pubs around the pedestrianized alleys of Niederdorf, while the lakefront has some of Zurich’s best restaurants, like the Restaurant Swiss Chuchi at the Hotel Adler or the traditional Raclette Stube for the Swiss specialty of raclette – who can say no to dipping things in melted cheese? Music lovers can venture to the grand Opera House which puts on hundreds of performances each year. 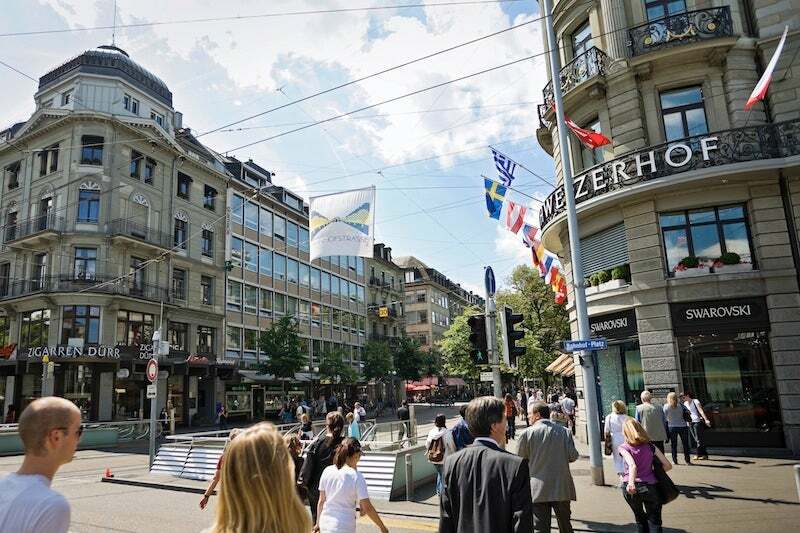 For more information, visit the Zurich Tourism site…and be sure to stop by a chocolate shop like Confiserie Sprungli to pick up some delicious souvenirs before heading home. The Altstadt of Zurich along the Limmat and the lake with the Alps in the distance. Zurich Airport is a major international gateway through which over 24 million passengers transited on nearly 300,000 flights last year alone. 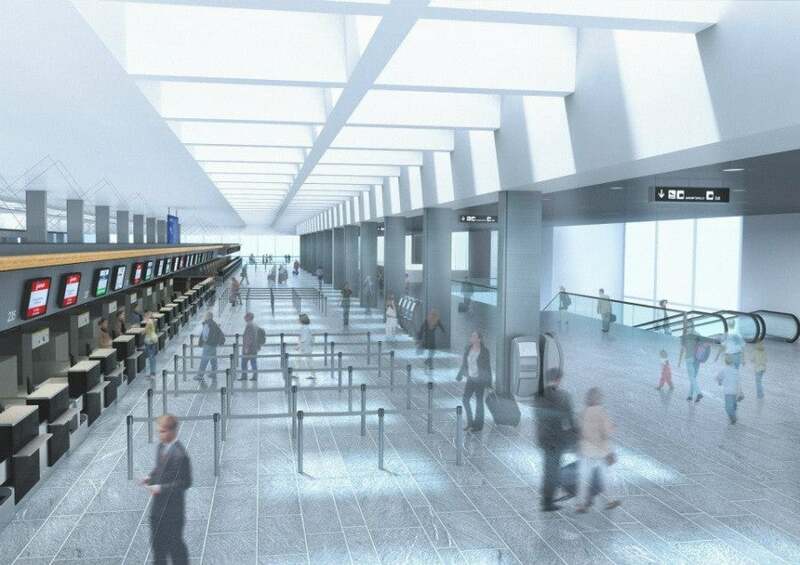 Its Terminal 2 is currently undergoing a massive upgrade, so expect construction until 2015 when flying through. You’ll find flights here in every alliance on carriers including Delta and Air France/KLM in SkyTeam, American and British Airways in Oneworld, and United, and of course SWISS, in the Star Alliance. Flights are about 8 hours from the East Coast, 10 hours from Chicago and 14 hours from the West Coast of the US. United actually flies a daily nonstop from both Newark and Washington Dulles, while US Airways offers nonstop service from Philadelphia three times per week. Air Canada also has one daily nonstop from Toronto. The major presence here is Switzerland’s national carrier, SWISS, which is part of Star Alliance, so you can use your United and US Airways miles (not to mention Aeroplan). It offers two daily nonstops from New York JFK and one each from Newark, Boston, Chicago, Los Angeles, San Francisco, Miami and Montreal. Design sketches for the airport’s upgrade to Terminal 2. In Oneworld, American Airlines offers a daily nonstop from JFK, as well as connections from various partners like two daily nonstops from Madrid on Iberia and even a daily nonstop from Helsinki on Finnair, as well as daily nonstops from Berlin and Hamburg on Air Berlin. British Airways flies seven daily nonstops to Zurich from London Heathrow. As for SkyTeam carriers, Delta has one daily nonstop from Atlanta while KLM offers several daily flights between Zurich and Amsterdam. To get to the city center from the airport, travelers have several options. They can catch a train from the airport railway station across from the Arrivals Hall. A one-way ticket to Zurich’s Hauptbanhof central station costs approximately $7. The trip takes just about 10 minutes. Visitors can also catch a tram from the airport into the city, which takes about 40 minutes, or a bus from the terminal located above Check-in 3, which also take about 30-40 minutes. Taxis wait in front of the arrivals hall. A ride into the city center will take about 20 minutes and will cost between $50-$60. Exterior of the Hilton Zurich Airport. 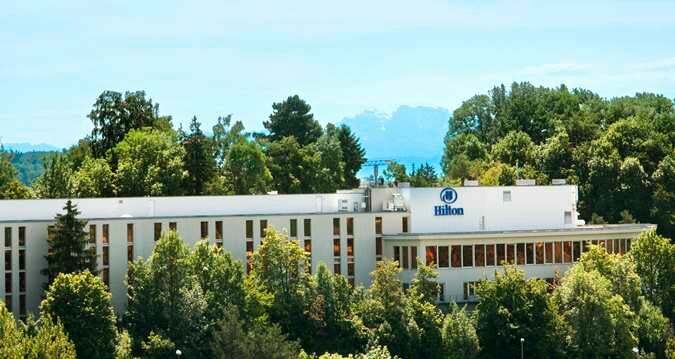 Hilton Zurich Airport: This hotel has complimentary shuttle service to the Zurich Airport nearby, and offers modern guestrooms with flatscreen TV’s and WiFi. There is an executive lounge which serves complimentary continental breakfast and refreshments throughout the day. Hotel dining options include Market Place, which serves breakfast, lunch, and dinner in an open-kitchen environment. The hotel has a well-equipped fitness center, and a business center for travelers with work needs on the road. For those looking to explore the downtown area, this property is located only six miles from the city center. Rates in October begin at 247 CHF ($260) or 40,000 Hilton HHonors points since this is a Category 6 property. One of the many Park Deluxe king rooms found at the Park Hyatt Zurich. Park Hyatt Zurich: This five-star property is located in the heart of Zurich’s commercial and financial districts and has just 142 guest rooms and suites with Bang & Olufsen flatscreen TV’s, Italian linens, bathrobes and slippers, wireless internet access, and marble bathrooms with separate rain showers and bathtubs. Guests have access to the Club Olympus Spa & Fitness Center, which has a steam bath and sauna. The hotel’s main restaurant, Parkhuus, has a 3000-bottle wine library with spiral staircase. The lowest rates we could find in October were 490 CHF ($515) for a Park King Room. This is a Category 6 hotel, so free-night redemptions require 22,000 Gold Passport points. 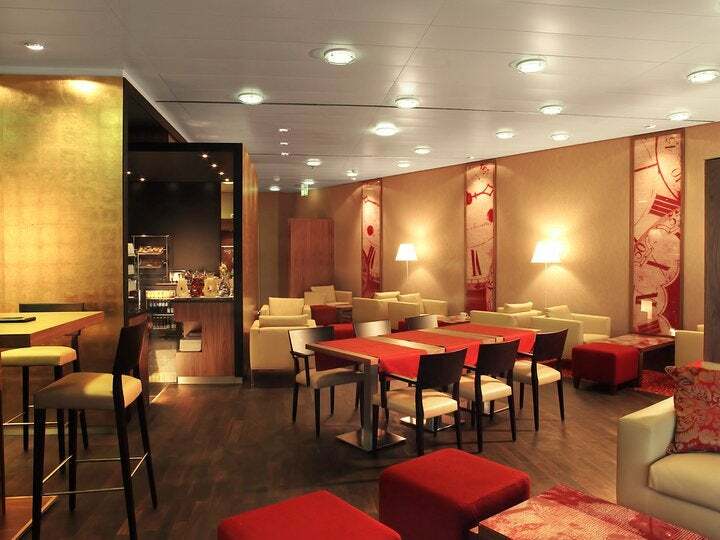 Concierge level guests have access to the Executive Club Lounge at the Zurich Marriott. Zurich Marriott: Located in the city center on the the banks of the Limmat River, this property has 255 guest rooms, including suites and executive-level rooms. All were recently renovated and feature new decor and modern amenities. The lobby and reception area has also been completely refurbished and there is a brand-new business center. There is a fitness center onsite as well. The hotel features several restaurants including Bar & Lounge 42 , eCHo, and a fine-dining Thai restaurant, White Elephant. Rates in October begin at 235 CHF ($250) a night. This is a Marriott Category 8 property, and requires 40,000 Marriott Rewards Points (35,000 with PointSavers) for a free-night redemption. King guest room at the Renaissance Zurich. Renaissance Zurich Tower Hotel: Built in 2011, this hotel boasts 300 guest rooms and suites with LCD TV’s, wireless internet access, iPod docking stations, and large bathrooms. Guests have access to the 15th-floor fitness center offering city views, and the wellness center with steam room and sauna. Dining includes a continental restaurant, Equinox, the hotel’s American bar, Lucid, and a tapas bar, Vivid. Rates in October begin at 195 CHF ($210) a night. This is a Marriott Category 6 property, and requires 30,000 Marriott Rewards Points (25,000 with PointSavers) for a free-night redemption. Other Marriott properties include the Renaissance Zurich Airport which is a Marriott Category 6 property requiring 30,000 points per night or 179 CHF. There is also the Courtyard Zurich North which Category 5 hotel so it will run you 25,000 Marriott Rewards points per night or 149 CHF. Exterior of the Crowne Plaza Zurich. 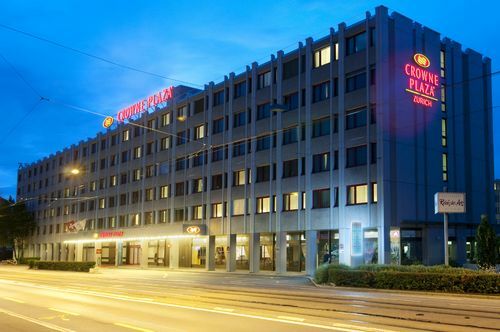 Crowne Plaza Zurich: This Priority Club hotel has 365 guest rooms and suites with all the usual amenities such as flatscreen TV’s, WiFi access, and iPod charging stations. Guests have access to the hotel’s indoor swimming pool and fitness center. Hotel dining includes an all-day dining restaurant, LetziLeu or the fine-dining Relais des Arts. The lowest rates in October are 136 CHF ($144) per night or 25,000 Priority Club points. Other Priority Club properties include the Holiday Inn Zurich-Messe near the Convention Center and 10 minutes from the airport by taxi, and the Holiday Inn Express Zurich Airport which is about 2 miles from the airport. 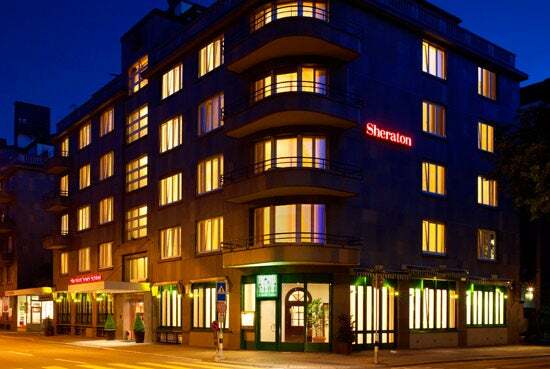 The Sheraton Zurich is located in the central business district. Sheraton Zurich Neues Schloss Hotel: Located in the heart of the city offering views of Lake Zurich, this boutique property only has 60 rooms including four junior suites and one superior suite. All the rooms come with Sheraton’s Sweet Sleeper bed, flatscreen TVs, and wireless internet access throughout. There is the Sheraton Link computer area in the lobby to stay connected. The hotel’s restaurant Le Jardin Suisse serves traditional Swiss cuisine using local ingredients. Due to the small size of the property, there is no fitness center onsite, but guests may use the Fitnesspark Stockerhof. Rates in October begin at 239 CHF ($254) a night. This is a SPG Category 6 property requiring 20,000 Starwood Preferred Guest points for a free-night redemption. 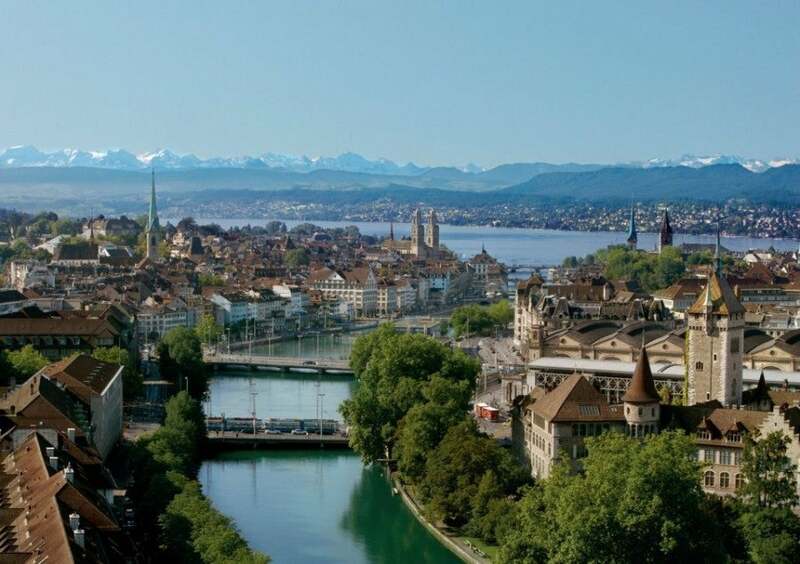 There is also the 132-room Four Points By Sheraton Silhcity-Zurich starting at 143 CHF or 12,000 Starpoints per night, as it is a Category 5 property. The Dolder Grand’s facade blends its original 1899 building with a 2004 addition by Norman Foster. Dolder Grand: Originally built atop Zurichberg mountain in 1899 as a sort of Alpine fantasia with turrets and timber accents, the Dolder Grand also has two modern wings built by famed British architect Lord Norman Foster in 2004 in a more minimalist Swiss style, reflecting the surrounding landscape in its glass and steel construction. The hotel has 114 sumptuous rooms and 59 suites starting at over 250 square feet with touches like parquet floors and all-marble bathrooms as well as WiFi access. The hotel also has a renowned 4,000-square-meter spa, a golf course, fitness facility, tennis court and pool. The hotel’s fine-dining outlet, The Restaurant at the Dolder Grand overseen by Chef Heiki Nieder is the first and only Zurich restaurant to be awarded two Michelin stars. Guests can have a more casual meal at the Garden Restaurant or in the Lobby café or bar. Rates in October start at 700 CHF ($732), but booking with your Amex Platinum through Fine Hotels & Resorts snags you a $100 food and beverage credit to use during your stay. The Park Hyatt Zurich is also an Amex Fine Hotels & Resort property. The spa-style bathrooms in the Alden’s suites feature deep whirlpool tubs and separate rain showers. Alden Luxury Suite Hotel: The Alden is the smallest five-star hotel in Zurich and is right in the heart of the city. It has just 22 individually furnished, spacious suites (they start at 645 square feet), all with standard amenities including full entertainment systems with flatscreen TV’s as well as high-speed WiFi, parquet flooring and spa-style bathrooms with rain showers and huge whirlpool tubs. The hotel also has a well-reviewed restaurant called Alden serving contemporary versions of classic Swiss dishes. Rates in October start at 535 CHF ($560). Both the Dolder Grand and the Park Hyatt Zurich are also Visa Signature Hotels.